The Sony DPS-V77 incorporates both quality preset effects chosen from the DPS-R7/D7/ M7/F7 sound series (these processors are trusted by professional musicians and producers alike) and a host of exciting newly developed effects that let you go beyond traditional genre classifications. In addition, the two fully outfitted multi-type effect blocks (each allowing you to choose from the full range of effects) and two EQ blocks allow for tremendously ﬂexible sound shaping. A primary concern when creating the Sony DPS-V77, was to provide musicians and engineers with a powerful operating system for fast, efficient, and creative sound control. The shuttle ring and ten key number pad provide almost instantaneous access to any effect, program, or parameter setting. The large display and function keys let you carry out simple edit functions directly from the play screen, perfect for live and/or studio situations where timing is crucial. Seamless changes between memorized effects (morphing*) Everyone’s probably encountered the frustration of changing effects in mid-tune only to have the previous effect cut out unnaturally (such as a sudden loss of reverb or delay). The Sony DPS-V77’s morphing function automatically crossfades the new and previous effects. Therefore, you can maintain reverb resonance while bringing in a flanger, or shift pitch while the chorus element fades. * You can only use one effect block when morphing. In addition to the 198 different preset effects created by musicians and engineers from around the world (PRESET memory), there is also room for you to store up to 198 of your own original effects (USER memory) to the Sony DPS-V77, We’ve also made it easy to organize the memory so you can recall effects you need without hassle. 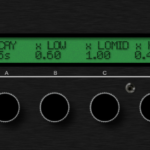 You can use MIDI controls like wheels and velocity effect controllers to adjust effect parameters in real time (RTC). 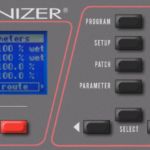 The MIDI interface also lets you conduct program change and data save operations. In addition to the two types of analog IN/OUT terminals, PHONO UNBALANCED and XLR BALANCED, the Sony DPS-V77 is also provided with digital IN/OUT capability (optional cables are available for either SPDIF or AES/EBU connections). Use the digital IN/OUT to preserve signal quality when making connections with CD players or additional Sony DPS-V77 units, or for direct digital mix down to DAT recorders. In addition, you can output signals from the analog input jacks as digital, output signals from the digital input jacks as analog, and even use both the analog and digital jacks at the same time.